How do I pick an alliance that's right for me? Now I'm in an alliance, and I've got powers to govern the alliance. What are they and how do I use them? Welcome back! As part of one of your tasks for the taskmaster, you've either joined or founded an alliance. Well how do you know you picked an alliance that's right for you? There are a ton of alliances on a server, even on a new one there are bound to be a few floating around. Not all alliances are going to be right for you. Some have different requirements, some are highly aggressive and some are more relaxed. Its important to pick an alliance that is right for you, and that is in your area. In this part we're going to explain how. So we're going to start with an application to an alliance. Most alliances aren't going to accept "can i join" as an application, so we're going to teach you how to write a proper IGM containing your application. Include a proper subject line. "no subject" or even "alliance" a lot of times don't get the point across. And busy alliance officers sometimes ignore such messages that they can't figure out within the first few seconds what it's about. Again just saying "can i join" isn't a very good application. Most alliances will expect something about your experiences, where you are located, why you want to join this alliance, any special skills you wish to bring to the table, etc. Basically, consider it a job interview. I always try to put a greeting and ending to my 'official' messages. It looks nicer and it makes you look mature enough to be able to handle being in a message. "Hello" and "Regards, [your name]" usually work well enough. 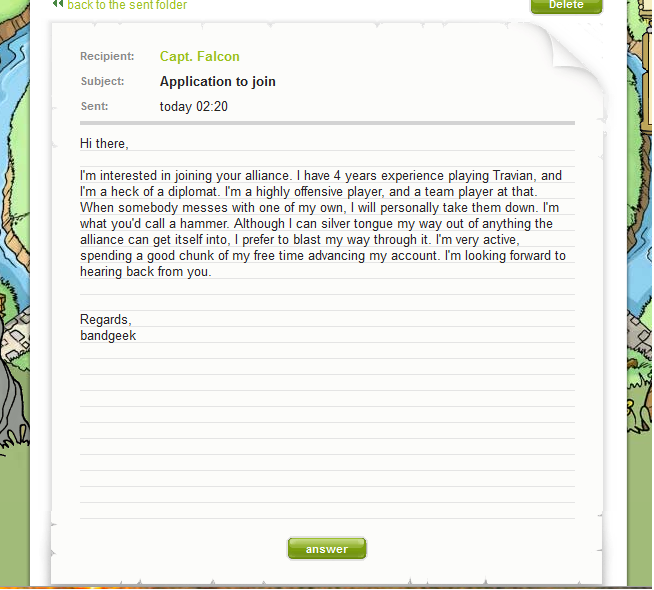 The alliance leader likes to know that you took some time into writing the application. So below, I'm going to show you an example of a poorly written application, and the response. And then an example of a well written application and the response to that as well. For this part, I've talked to Capt. Falcon, of the alliance GT on com7. i can join ur alliance? And if I had to guess, this application is going to get denied. I of course would deny this. In my experience of being an alliance leader, messages sent like this are instantly deleted. Notice the subject line I gave? "no subject" is a terrible description line and should only be used if you know the person. I'm interested in joining your alliance. I have 4 years experience playing Travian, and I'm a heck of a diplomat. I'm a highly offensive player, and a team player at that. When somebody messes with one of my own, I will personally take them down. I'm what you'd call a hammer. Although I can silver tongue my way out of anything the alliance can get itself into, I prefer to blast my way through it. I'm very active, spending a good chunk of my free time advancing my account. I'm looking forward to hearing back from you. Now with this second message, I was clear, and right down to the point. I gave him a brief overview of my experience with Travian and what I offered. And it's not too long winded. Now of course, everybody will have different experience levels, and different talents that an alliance might want. And yes, of course, there are many different styles of applications. Some alliances have very specific applications they want you to use. Do some research and find out about what the alliance you're applying to wants. Most will have them either listed on the main page, or in their public forums. ***VERY IMPORTANT*** Be honest. If you say you're an excellent diplomat, you should be an excellent diplomat. If you lie on your application, it will blow up in your face, and you will wind up looking like an idiot. So, now I've heard back from Capt. Falcon. He completely ignored my first application. Didn't even bother to give me a response, which is what a lot of alliance leaders/officers will do. Appreciate your interest in the alliance, you certainly appear to be a skilled player. Just have a couple quick questions to try and get a better feel about you and to help ensure that the relationship would be mutually beneficial. First off what attracts you to our alliance, are you applying to others as well and just hoping to get picked up by anyone or is there something that interested you in our alliance specifically. Have you been in any other alliances. What specifically separates you from other players. I apologize for the long message but we take becoming a member seriously, as I'm sure you take joining, and is a big part of why we have the loyalty and teamwork we have here. Feel free to ask me any questions about our alliance, as this relationship would need to work for you and us for it to be successful. Look forward to hearing back from you. My reasons for wanting to join your alliance? I join the best, and you clearly are the best. Why mess around with the others? I like the Marine's way of doing things "Mess with the best, die like the rest." I used to be a part of a very powerful alliance, but on different servers. And my friend, we were the best of the best. The plan was for us to join this server and conquer it, but uh hehe my alliance crapped out on me. I'm different from every other joe on the server because firstly, I know what I'm doing. And secondly, when I strike hard and fast. Every person who has ever stood in my way was quickly crushed. I'm a winner, and that's what I intend to do, with or without you. Although, I'd much rather be with you. And yes, I believe a strong relationship between the alliance is one of the keys to success. I personally will fight for anybody who flies the same colours as I, but I'm more willing to fight harder for somebody I like. This biggest part about that entire message is "If this sounds like what you want to be a part of, then let me a do a sitter check to check things out, we will bring you on for a 1 week trial basis to ensure that this works well for both of us and then you will be a permanent member." In case you don't know, that's a yes to my application. So now you know how to apply to an alliance, and probably get a better response. Now I'm going to teach you how to pick an alliance that's right for you. I picked GT, which at the time of the writing of this, is ranked #1 on the server. But if I would of checked it out and had of actually been applying, it probably wouldn't of been the best fit for me. Do you meet their requirements to join? If not, you will most assuredly be turned down. Are you near any of their members? If you are not, and they are hours away, it is very hard to provide/receive support and supplies. Being a part of an alliance is for the point of working together for the greater good of the alliance. If you are in the middle of nowhere as compared to the rest of the alliance, that becomes very hard to do so. Are they offensive based or defensive based? Every alliance is different, including their styles of conducting business and playing the game of Travian. If you are a highly offensive player who catapults anything that moves, it may not be the best to join a highly defensive alliance. Do they have weekly raiding or activity requirements or other requirements imposed on the members to stay a member? Sometimes alliances require that their members raid a certain amount of resources per week. And most have an activity requirement. Are you active enough for this alliance? If you tend to be a casual player logging into your account every couple of days, a highly active alliance is not for you. All of these are very important questions, and should be answered before you apply to an alliance. Now, I'm going to teach you how to interpret the alliance overview page. 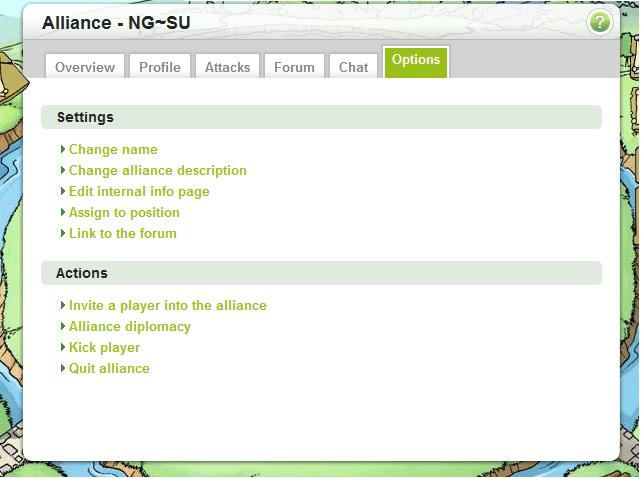 Below is a screen shot of an alliance's overview page. Again since I already have their permission to do so, I'm going to use the alliance GT. Tag: The shortened version of the alliance name, which shows up in the stats page as well as diplomatic relations etc. Name: This is the full name of the alliance. Rank: The rank the alliance is on the server. This alliance, GT, is ranked #1 on the server of 573 alliances currently. The rank is based on their amount of points compared to others. Points: The alliance's points. It's based mainly on the combined population of the members. Members: The number of members currently in the alliance. If you scroll down, you can find a list of their members and other information about each member. 3) These are different leadership positions within the alliance. They are assigned by anyone who has the option to assign to position. 4) Description fields: Like your profile, alliance profiles have description boxes. 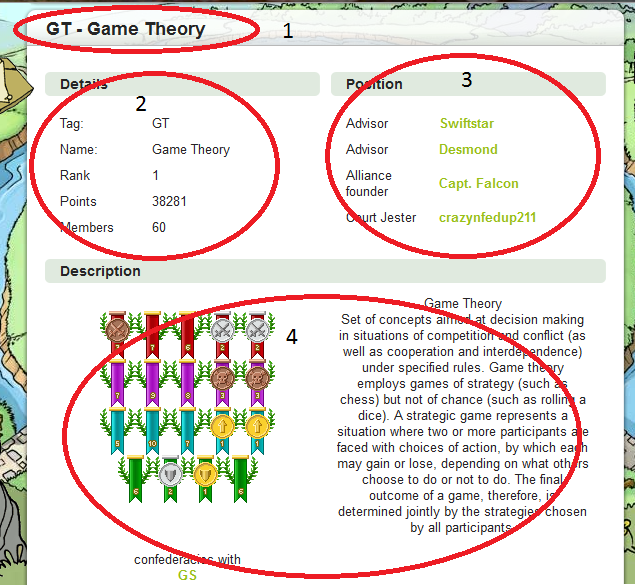 On the GT description boxes you find some information about the alliance, their medals, and their confederacies. In the world of Travian, confederacies are alliances between alliances. Friendships, basically. Change name: Change the name or tag of the alliance. Change alliance description: Change the alliance's description, which is viewable by anyone. Edit internal info page: Under the tab "overview" you see a bunch of information. What the members see can be edited here. Assign to position: Give users leadership roles and rights to go with them. Link to the forum: If your alliance has created an external forum, then you may enter the URL to your forum here. Whenever somebody clicks to the alliance forum, it will take them to the external alliance. 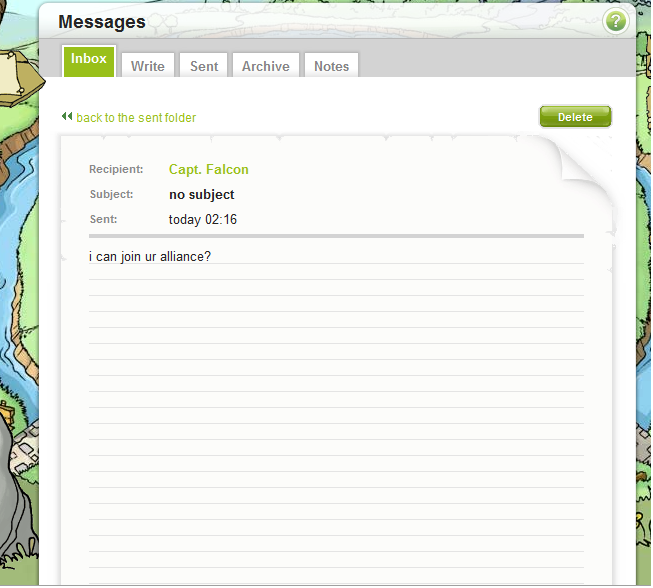 Invite player into the alliance: In order to join an alliance, somebody must be sent an invitation. Do so here. Alliance diplomacy: Edit which alliances your alliance calls friends, neutral, or enemies. Kick player: If you decide that you no longer wish for somebody to be in the alliance, you may remove them from the alliance here. Quit alliance: Removes you from the alliance. All of the given powers must be assigned in order for somebody to use them, except the quit alliance function. Thus, anybody can remove themselves from the alliance at any time if they decide they no longer wish to be a part of the alliance. I clicked "Write message" and wrote a very rude message. Basically acting like a complete jerk. This is never the way to contact the Multihunter (abbreviation: MH). Although at times they seem cold and heartless, they are simply doing their job. And when you send a message to them and act like you are the big bad wolf, you won't get a good response. In fact, my MH replied briskly saying that I had violated the rules by insulting another member and/or using foul language, which actually sounds like something I might would get banned for. However, the MH didn't give me the chance to make amends, or get unbanned. 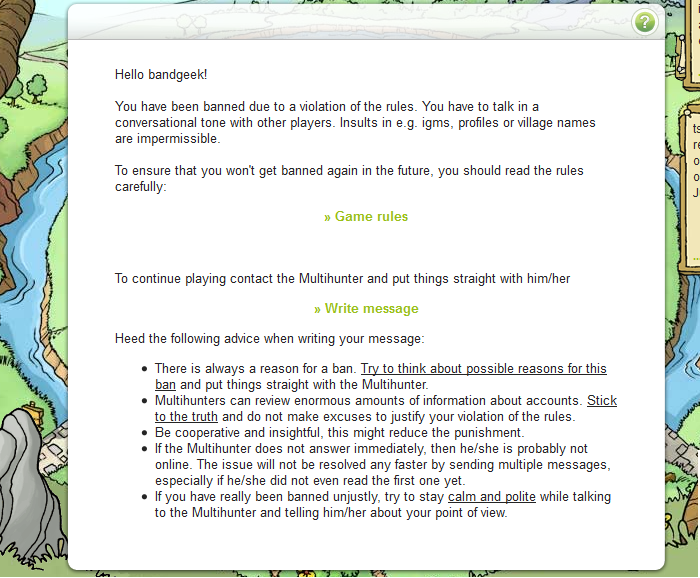 I realize what I've done was wrong and against the rules of Travian. I had simply had a bad day and taken my frustrations out on another player, which wasn't what I should have done. If I knew I was in a bad mood, I should have never logged on and taken it out on another player. Please help me to resolve this ban so I might continue playing. Now with this message to the MH, I acted maturely and completely confessed what I did (insulting other members/using foul language) was wrong and against the rules of Travian. In such a situation, one must remember that the MH can see all, and very rarely make a mistake in swinging the ban hammer so to speak. HOWEVER if you contact them swearing and being a jerk, even if you are innocent, it won't help. You are correct in that you have been banned for insulting/offending another player. Going forward, please do remember that many children play this game and follow the netiquette rules to help make a better playing environment for both them and other players. I have unbanned your account without penalty. Please consider this a warning though. If you have any further questions, please, do not hesitate to contact me again. This was a minor offense, however, one must remember that sometimes even if you contact them and act maturely, they don't unban you or with penalty. Make sure to read the rules and be aware of what is allowed and not allowed. Another reason you might have to contact the MH is to report another player. If somebody swears at you, makes you feel uncomfortable, or they use otherwise inappropriate subject material while writing you, report it to the MH at once. They can ban the other person or talk to them or take further action to prevent it from happening. You should always include the link to the message. Otherwise the MH cannot do anything. ***VERY IMPORTANT*** A lot of people have the notation stuck in their brains that because they are not doing very well against a player, that the other player must surely be cheating. This is not always the case. If you report something to the MH, they will always investigate. But 90% of the time it turns out that the other player is completely within the rules. To contact the support just write an IGM to the recipient Support. Support isn't to send more troops, contrary to popular belief. They answer your questions about the game. And they can usually put you in contact with the right people if they can't help you. One must remember, however, that support has nothing to do with the MH and are completely separate for the server. Thus pleading to the Support about your ban case won't help anything, as they will tell you to contact the Mulithunter. 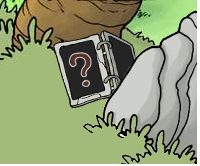 Because of our Plus feature in Travian, it's also needed that we have a way to contact somebody specifically for issues with it. If you click the help icon in the bottom left hand corner of the screen, you will be given several options. One of which being to contact plus support. If you click "Plus questions" you will be able to send a message to the .com plus support. Such questions to ask should be about gold/plus problems. If it's just a general question about plus features, you can usually send them to your server's Support. Alternatively, you can send an e-mail to plus@travian.com. ***VERY IMPORTANT*** Please remember that when you send a message to any of the Travian Team for the domain, they have a lot of other messages. But, they will always reply to your message in due time, which is within 24hrs. That does not mean that they will handle your case within 24hrs. Sometimes it takes longer if they need to consult with somebody else. If they have not replied within 24hrs, send another message to them, and politely remind them about your message. Otherwise, please sit tight and remain patient. Please note: These e-mails are specifically to contact members of the Travian.com crew. On another server, you would need to change the domain. And this concludes this month's edition of Bandgeek's Guide for Beginners. It's been a pleasure, as always, and make sure to check in next month for the next part of the guide!